Sports Cards Plus has purchased a large collection of the very first Upper Deck All-Star Vinyl Series Figures. 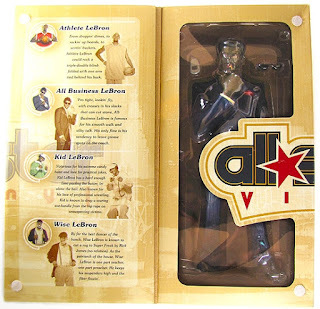 The Lebron James Figures were from the very first production run in 2004 and are Lebron's "True Rookie Figures." These very limited figures (some with production runs as low as 250) start for as little as $49.95. CARLSBAD, Calif., Jan 25, 2007 -- They can throw a spiral faster than a speeding bullet. Bowl over defenders for a first down with more power than a locomotive. Leap over an end-zone wall into an adoring crowd in a single bound. In the minds of many fans, NFL stars have powers beyond those of most mortal men. Helping to perpetuate that point of view, Upper Deck will launch three superhero-inspired vinyl action figures based on three Super Bowl-winning quarterbacks during the week of the big game: Ben Roethlisberger (Jan. 30 at 9:07am PT), Brett Favre (Jan 31 at 9:04am PT) and Tom Brady (Feb. 1 at 9:12am PT). Only 1,000 of each have been produced and will be offered exclusively online (www.allstarvinyl.com; MSRP $49.95), making the 11-inch action figures -- based on the stylized realism found in comic-book art -- arguably the most limited league-licensed football figures ever released to collectors. 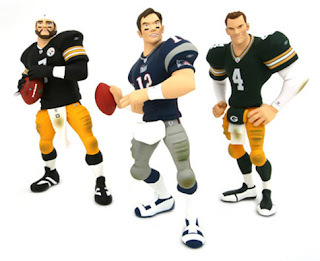 "Even though these quarterbacks put up big numbers each season, we're going to keep our numbers on this release extremely small staying true to the roots of low run limited edition vinyl figures," said Upper Deck sports figure product manager Dave Sanders. "Like their real-life athlete's on-field ability, these figures are extremely rare. And like their fan's expectations, product demand will be high. If history is any indicator, there's no doubt they'll go fast." 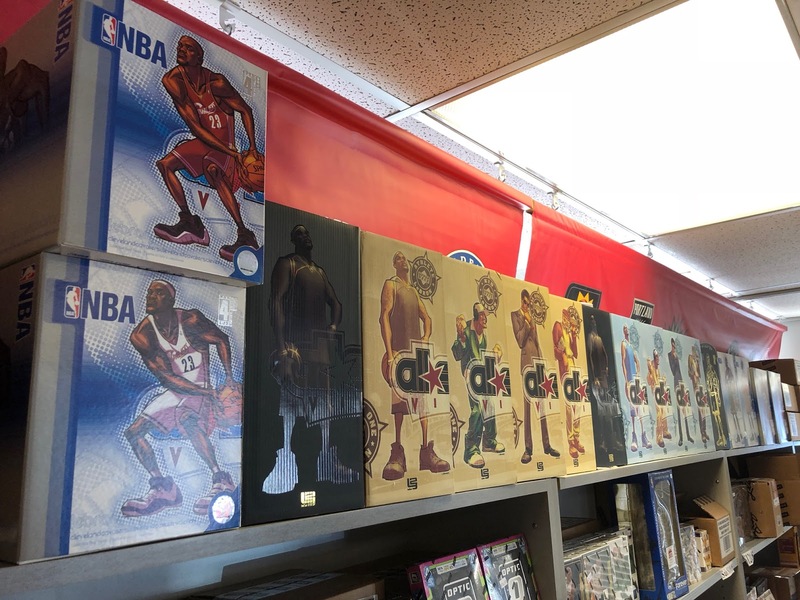 According to Sanders, Upper Deck's first vinyl figures -- featuring LeBron James -- sold out in a little more than an hour. 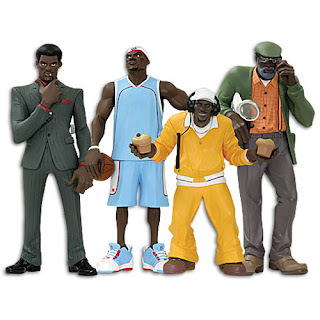 The Super Bowl quarter back series represent the first licensed vinyl figures from a sports league, and are a follow-up to Upper Deck's successful "The LeBrons" figures released last year in partnership with Nike and centered on LeBron's latest sneaker campaign. Sanders also noted that Upper Deck's January NFL release is the start of All-Star Vinyl's product launch in all four major sport categories. Its NBA and NHL athletes hit retail in March, MLB players in May. In total, 38 elite athletes of the present and past will be unveiled on the All-Star Vinyl label in 2007. 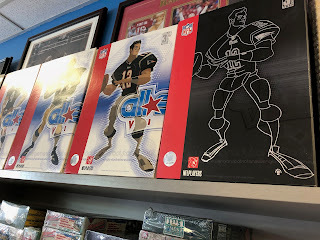 At 11 inches and produced in the underground style of urban vinyl, Upper Deck's All-Star Vinyl NFL quarterbacks are a combination of art and realism not typically found in sports licensed products. "In this medium, our designers are able to have fun by adding or playing up on player attributes and subtleties that give life to these athletes, highlight their distinct features, playing style -- design characteristics that make them highly unique in comparison to more traditional based sports figures." To that, Sanders pointed out the cleft in Brady's chin and Roethlisberger's pinky on the ball, lifted a half-inch from the laces. Other features of note: Brady's eye black and boyish cowlick; Roethlisberger's backward baseball cap and hockey-style playoff beard; Favre's steely blue gaze and ever-present hand warmer and towel. All three action figures are featured in their team's home jerseys, complete with Reebok logo on sleeve, NFL logo on chest. Away versions of all three quarterbacks will be launched in July. To find out more on the Super Bowl quarterback set, Upper Deck has set up a blog written by Sanders: allstarvinyl.com. It will also give consumers a first look at upcoming sports action figure launches throughout the year, giving insight into the athletes to be featured, as well as the artist and sculptor behind the piece. San Diego-based freelance comic and figure artist Sean Galloway, 32, designed the All-Star Vinyl Super Bowl quarterback series. Galloway's credits include commissioned art for Batman, Hellboy and Teen Titans. "I love to create art; but what I love even more is to create with meaning. This project allowed me to reinterpret NFL players as we all envision them -- larger than life," said Galloway. The artist's artwork is featured prominently on each figure's packaging, giving collectors insight into the design of each player. The sports action figures were sculpted by Rocco Tartamella, a well-known toy sculptor who has done work for such clients as Mattel, Hasbro, and McFarlane. Taratamella also sculpted Upper Deck's LeBron series. Founded in 1988, The Upper Deck Co. is a premier global sports and entertainment-publishing company that delivers a portfolio of relevant, innovative and multi-dimensional product experiences to collectors, sports and entertainment enthusiasts. For more information on Upper Deck and its products please visit www.upperdeck.com or www.upperdeckstore.com.